What a marvelous action puzzle ! 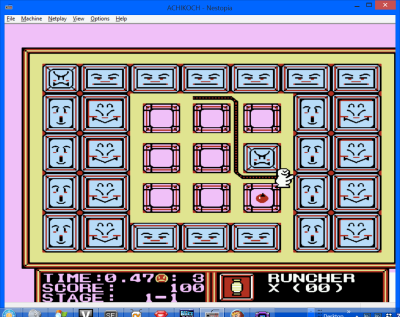 I've seen a game very similar to this on the NES called, Achikoch. Where the object of the game is to encircle your lasso around each of the squares. The center will change to a new image when you do. Harder levels include wandering enemies plus companions that follow you around. Welcome!! This is a very fun game and with such smooth action. I feel like the "cost" of hitting an enemy is too light. It's not so much that they are easy but that simply losing a heart doesn't seem to be enough to dissuade me from running right through them. Perhaps some screen shake to make the impact more forceful, or fewer hearts to make the impact more frustrating would increase the stakes. Electricgryphon i've added a little shake when you lose a life like you have sugested. Thanks! That did the trick for me. You are right about it getting much harder around tombs 3-3 or so. 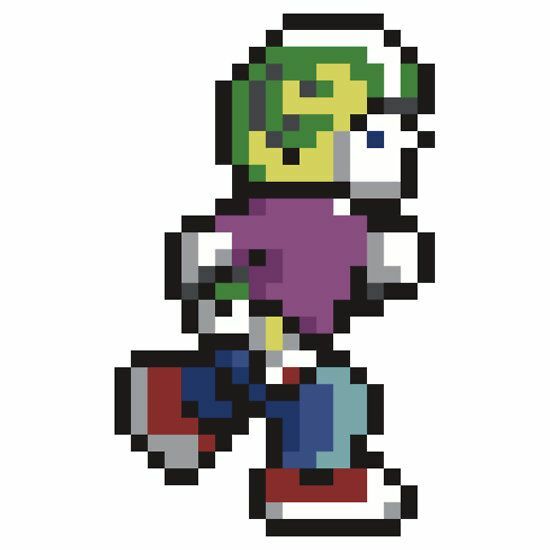 There are so many of the shambling shy guys and they just won't get out of my way when I have a devil on my tail. 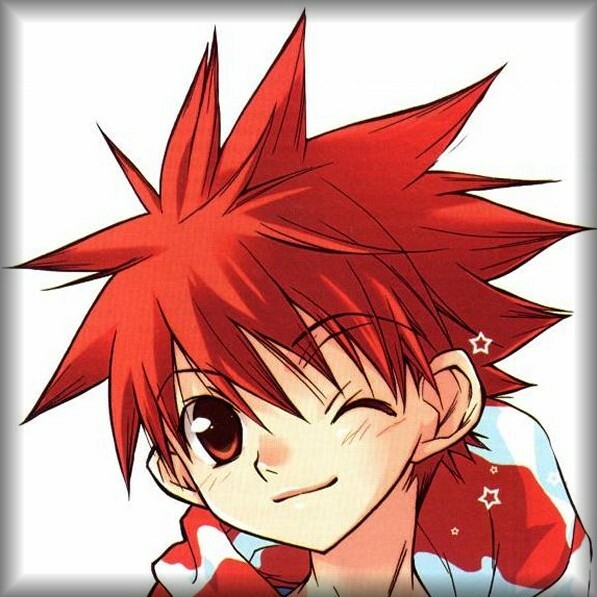 That bunch of crazy red imps that get released! Argh! Getting to run along where the score usually is! 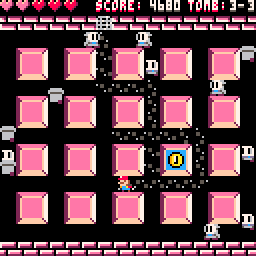 For your very, very first game here that was created on the Pico-8 platform here, Hokutoy, you did quite a splendidly damn amazing job on this truly MOST WONDERFUL remake of Gem Software’s 1984 own maze-game classic of “Oh Mummy”... and I absolutely love the way you used the colors for the remake indeed, as well as even rather more importantly the gameplay, the first-rate controls, the smooth difficulty curve, and such top-of-the-line execution overall – all the way right down to how remarkably superb the game actually plays!!! When there are so very rather many enemies on the screen at once on any one board, you gotta really, really plan your course of strategy wisely in order to make your way towards uncovering and gathering the items you need as well as that all-important key, and then get right on to the exit and through that door on the very top... but should you accidentally reveal that dreaded ‘skull’ icon while there are more than already 10 enemies onscreen simultaneously to begin with, all of the additional purple devils will most rampantly home in on your position... and then you are in BIG trouble, adding some extra well-needed frantic challenge and pressure to the proceedings. And I just love the way you have successfully ramped up that difficulty curve slowly but surely from easy to very hard in an indeed so very smooth fashion before giving the person a well-needed break in the challenge which then ramps up once again, Hokutoy, truly to ease the player into the game and to actually give him/her that excellently satisfying ‘One more go! !’ feeling as he/she actually gets better and better towards beating that high score – which I so ever-truly love in such a retro timeless classic like this phenomenal little remake on the Pico-8, let’s get that absolutely right in an exceptionally quite excellent way indeed!!! (^-^)=b !! On the whole, “PIC-Oh Mummy!” is a stunningly plain brilliant little game in a nutshell that does the quintessential Amstrad CPC 1984 computer original of this such resplendent grand justice, making it even more an even grander timeless classic on the Pico-8 platform, and most definitely must be played by everyone of any age, period. Very, VERY HUGELY RECOMMENDED, Hokutoy, and my deepest congratulations to you from the heart on such a rather seriously quite outstanding first attempt well made, too!!! Wow Adigun A. Polack thanks for the nice words! To tell you the truth a first play with an score of 13250 tomb 6-4 is an awesome mark! I think the game is well rounded and very polished so i'm satisfied with the result. I hope that everyone will enjoy it! One think i don't explain in that the "heart chest" gives you one live x number of tomb... so in tomb 3 give you 3 lifes, in tomb 5 give you 5 lifes.... so it's important to discover the heart chest to stay alive. PD: I've update the game with minor glitches... a little more space for highscore so the number don't seem hooked. 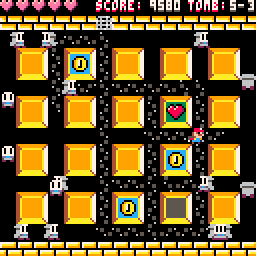 And a minor gfx glich at the treasure chest in tomb 3. I played this a lot last night and didn't run into any problems (even on PocketCHIP). Code optimization is only valid if you really need it. If your game runs nicely, so what if the code is messy? If you want to refactor for your own skill and maintenance, that's great (that's what I do) but it's too easy to run down a rabbit hole when it's not really necessary. That's one thing I like about Pico8...it'll run the same whether code is clean or crap. Lets me worry about the game experience rather than the code behind it. I never played the game this is inspired by but this is a lot of fun...I got pretty far. Only thing that I wish was in there was different colors for the different speeds of the non-devil bad guys...some seem to move slow, fast, etc. Too late, Hokutoy. What was it the guy said when he opened the Ark Of The Covenants ? "It's beautiful !" Anyways, totally agree with Morning Toast. If it runs nicely, so what if the code is messy ? Thanks for making this. Love it, the game was one my earliest gaming memories on my CPC. Now we just need a remake of Harrier Attack. I must optimize the code or with a new version of pico-8 it will get better performance? Hi geistvonpa thanks for your coments! You can make corners very easy if you press the new direction while running. The character while turn automatically when the direction pressed comes avaliable. For example, to enter the dungeon from the gate at the start, simply push right for a second and then let it go and push down. The character while go right until he finds the gate and go down. Try it. It's very easy when you get the hang of it. This is really great. Had Oh Mummy on the trusty Amstrad back in the day and this is a great version. I like the way you've added different enemies and improved their intelligence (I think they just moved randomly in the original?). Also love the music...agree that it really is part of the game. Wasn't sure about the controls to begin with (the way it 'slides' around the corner, unlike the original IIRC) but it's good once you get used to it. This game deserves playing with classic gamepad :) Already ordered one. Anyone with a nice score? Fun game! Super GREAT for a first game! Mine was a slight mod of a game I typed in ... way back in 1980... and this is waaaayyyyyyy better!